Tired of listening to the nasty grind of an old garbage disposer? Looking to replace your existing unit with one a bit more advanced, quiet, and easy to maintain? Then you might want to read our InSinkErator Compact review. This disposer is durable, but the compact design is an excellent choice for anyone who has space limitations in the kitchen cabinet below the sink. A large grind chamber capacity of 34.6 ounces for ease of waste disposal. Comes with a 120 Voltage hookup so the unit operates off the standard electrical outlets in your home. Energy efficiency: This disposer only uses 4kWh a year. For more information on the specifications of this unit, check out the specs here. A compact design measuring 12.125” high, 8” depth, and 8” length. The exterior has an attractive dark gray enamel with stainless steel accents. Stainless steel grinder parts to ensure the longevity of the disposer. With the InSinkErator Evolution Compact disposer, you’ll be getting a compact unit that fits easily inside a tightly spaced kitchen cabinet. 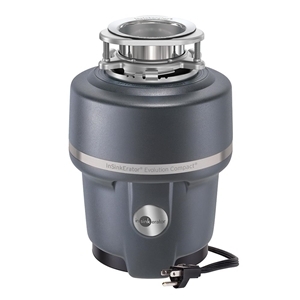 In terms of noise reduction, the InSinkErator Evolution Compact is exceptional because you’ll get a disposer with SoundSeal® technologies. A special collar to minimize sink baffle vibration. SoundLimiter® insulation for noise reduction. The InSinkErator Evolution Compact 3/4 HP disposer is a unit with continuous feed, meaning the disposer will continue to operate from the moment you hit the switch to power it on up until you turn it off. The benefits of continuous feed unit include greater affordability, the ability to dispose of larger amounts of food waste with greater speed, and the convenience of having a powerful disposer within immediate access whenever you need it. The InSinkErator Evolution comes with MultiGrind® technology as well, so you get not one, but two stages of grind when dealing with waste: Essentially, the disposer liquefies the food waste. The attractive looking exterior will blend well in the modern kitchen. The 3/4 HP motor is quieter than the 1/2 HP units on the market because the motor offers additional horsepower and sound dampening features. The InSinkErator Evolution Compact is made in the USA so you can support American jobs & the economy. The stainless steel parts in the disposer are non-corrosive to ensure a durable product. The unit comes with a four-year parts & in-home service warranty, meaning you get a free house call and visit from a certified professional if you have any issues with the disposer. The unit is environmentally friendly because it reduces greenhouse gasses and carbon emissions. You can make the grind quieter by running water. The outlet drain’s rubber adapter could be thicker for greater durability. The power cord does not come with the unit. You’ll have to buy it separately if you don’t want to wire the disposer directly. The unique anti-vibration design of the sink baffle causes water to drain slower. The unit does not have a jam loosening tool or access for fixing jams when necessary. When the device is running, it will cause the sink to vibrate a bit. You can grind up everyday food waste in the unit, but you need to avoid fibrous food waste such as artichokes, cornhusks, and celery. In the effect of odor-causing buildup, you can use disposer cleaner to eliminate the odor. If you have citrus peels, you can use them to freshen up the drain of the unit by using them as an all-natural odor eliminator. Don’t use hot water when you are grinding waste. When the grinder is not on, draining hot water is fine. If you’re looking for a practically priced, easy to install, durable disposer for your kitchen, the InSinkErator Evolution Compact 3/4 HP is worth every penny you invest in it. The cons associated with the unit are relatively minor, especially when compared to the myriad advantages you derive from the disposer. The powerful motor, durable design, and dual stage grind make the InSinkErator Evolution Compact disposer a promising unit for your home. We hope you find our InSinkErator Compact review useful.